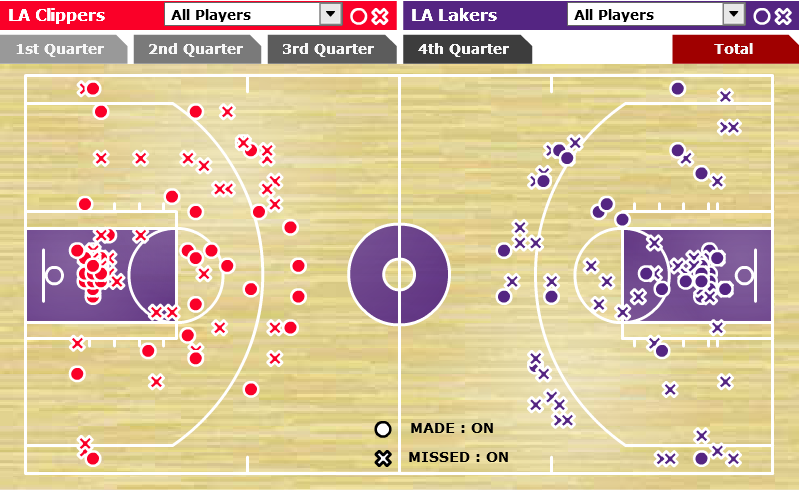 ESPN.com’s shot chart of last night’s Clips-Lakers whatever-that-was-we-watched. If last night’s blowout between the Clippers and Lakers actually happened and wasn’t one of those bizarre dreams you have while napping, it can be clumped in the middle of a special group of games where a team (or sometimes both) absolutely feasted at the rim. Unfortunately for the Lakers, the Clippers were responsible for over two-thirds of those (mostly) bunnies all while they gave the purple and gold their worst loss in franchise history. 40 of the Clippers’ points within the restricted area came from lobs finished by Blake Griffin and DeAndre Jordan, baskets by Darren Collison, and whatever Danny Granger has left in him. The team as a whole totaled 60 points inside that half-circle that was like a landing pad after fast break opportunities. The production from that area of the floor ranked above 99.5 percent of all single-game shot location logs this season plucked from NBA.com. The Lakers lead the league in most field goals allowed inside the restricted area and most attempted there, and it’s not that close between them and second place in those stats. So maybe it’s not that big of a surprise to see them on that list twice as an opponent, especially when Detroit typically scores a ton of their points at the rim and the Clippers added some extra salt during the third quarter of last night’s game when it was over by halftime. 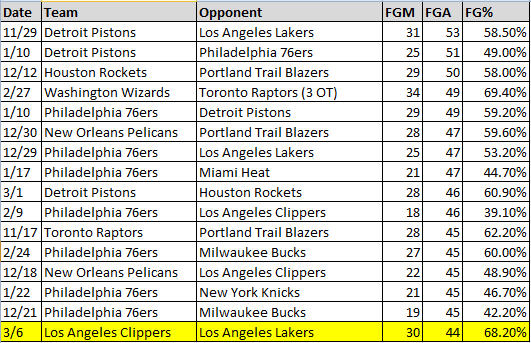 As for the field goals the Lakers allowed the Clippers to attempt around the rim, last night’s 44 shots weren’t that close to the league’s season high of 53. Unfortunately for the Lakers, that was set in their game against Detroit (which they ended up winning, though). Going into the last five weeks of the season, we’re bound to see another outlier game or two allowed from any shot location not just by the Lakers but other teams limping to the finish line like the 76ers (poor Thaddeus Young), New Orleans (poor Anthony Davis? ), and the New York Knicks (poor, poor Carmelo Anthony), among other teams. But who knows? Maybe the Lakers will be on the good side of one of those outliers. After all, in their last 20 games they’ve been one of the best 3-point shooting teams both in volume and accuracy, so there’s that. The least that could be asked out of them right now, however, is for last night to never happen again.